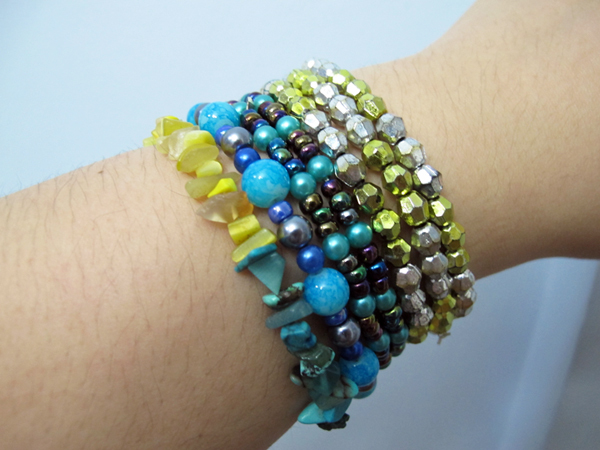 Beaded Bracelets: DIY by me! Sundays are my best days for dressing up, especially since comfy tees and jeans or sweatpants has become the norm due to the thrice-a-week rehearsals we've been having for an upcoming Christmas musical. Let me digress from the outfit by sharing a personal story. Unbeknownst to many, I (ehem, ehem) can now sing! Believe it or not, I grew up with an unattractive-throaty-hoarse voice that made the boys relentlessly tease me as the platinum-blonde haired wrestler, "Ric Flair". It didn't help that I was also on the heavy side too. To add to the humiliation, when I was ten or eleven, my mom made me join a church choir. Due to the lack of vocal range and probably the raspy sound that came from my throat, the choir teacher told my mom not to bring me back. I was devastated and stayed away from any type of stage singing for years to come. A couple of years back, a friend invited me to join their choir. I resisted, but she insisted, saying "If the heart is willing, the voice will follow." Feeling a need to give it another shot, I auditioned and got in. After an introductory session with the choir conductor, she told me to develop my singing because I had potential. Potential. Just that one word opened a plethora of possibilities and I was determined to give it my best shot. Fast forward to the present and I will be among those singing in the Henry Lee Irwin Theater of my ol' alma mater, Ateneo. I've even got a bit of a solo. If I could talk to ten year old self, I'd tell her not to lose her spirit. Never mind the naysayers, I'll say, because there will be a time for blooming and yours will come in time. What about you? What talent, skill or passion did you discover at a later age? Love your shoes! So chic! Also your skirt is amazing! You look adorable! What a great story!! Happy that you get to share your talent now. :) I love those flats, so cute! Thank you, Amy! I'm glad too! I started out that way too, but I guess singing can be learned? So there's hope! Hi there! Thanks for visiting my blog and for leaving nice comment. Cute outfit! Maybe we can follow each other? The neon cap toes are so fun! And enjoy yourself while you're singing out there - you'll sound great! 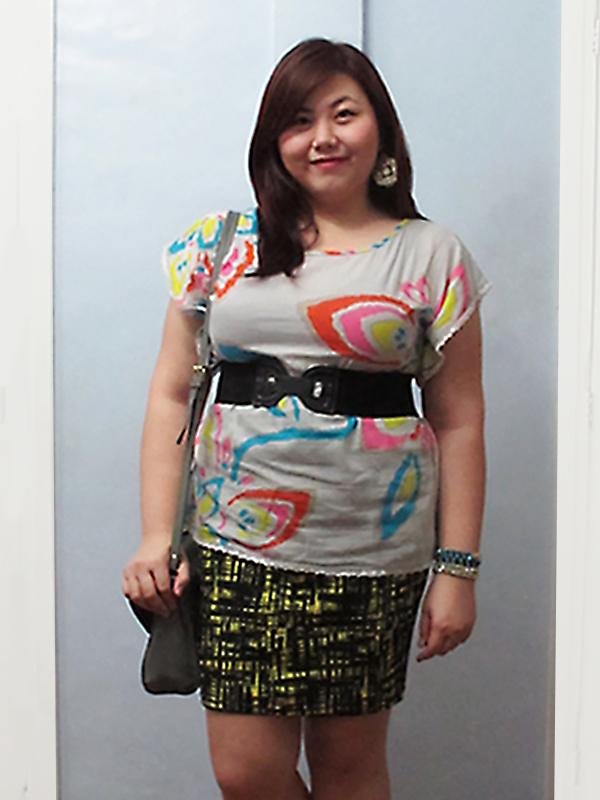 I love the mixing of prints! So very cute! Yes, neons are always a cheer-me-upper! I love the neon tweed skirt with the matching shoes. I really want the skirt. You look fab! Thanks for stopping by my blog, would you like to follow each otheron bloglovin as well? You made wearing Neon looked so lovely, I wish i could pull the same thing. 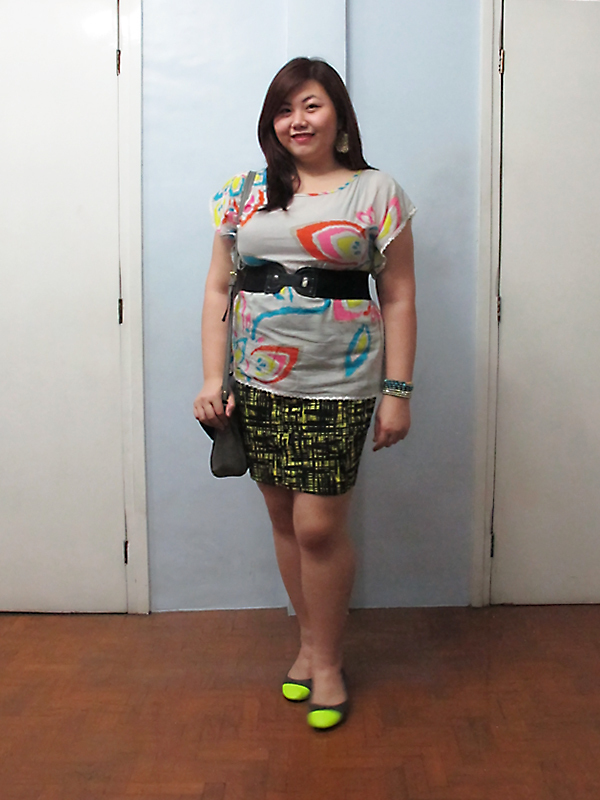 I love the way you styled the outfit perfection with the neon touches. PS. Thank you for your comment on my blog. Would you like to follow each other? let me know. Thanks Mitha! LOVE the name of your blog! These look like the shoes you wore in the "Green ATS in Tagaytay" post. Normally, I don't usually like the cap-toe shoe trend (especially with metallic tipped cap-toes); but these are surely attention-grabbing, especially if this lovely top and skirt combination don't make a statement already. You're always the first one to notice these things! Happy holidays to you too, John! you are beautiful. I love your skirt. Love this outfit, especially the shoes and the skirt!